The season too, but I mean my horse Summer. Well, really she is my son’s horse that he lets me ride. She is not cuddley or lovey, but I am pretty sure she likes me. I hope so at least. She puts up with a lot from me. I first saw her as a foal when I was checking horses with my 92 year-old employer at the time, Buss. At his ranch there were a few mares that were the result of decades of natural selection, their foals and one stallion to populate the riding horses. At Buss’s South Dakota ranch, the horses live on about one thousand acres. They were looked at about once a week, never de-wormed or vaccinated. No hoof trims or shoes. If they are not immune to whatever comes their way, well, you get the picture. These were a tough group of horses. Cowy too. If someone had to get off their horse to move a rig down the road, you looped your reins around the saddle horn and your horse would continue to do their job pushing cattle with the other riders keeping any cow that had a different idea, with the herd. This is not a cushy place weather-wise either. The first winter I was there in 1996, the year Summer was born, it was never above -20 degrees F for two months. That doesn’t count the wind-chill factor. There were about two weeks straight that the wind chill was -65 degrees F. It was cold. I know. I was out in it trying to get the tractors to start to feed the cattle. Cold. The snow never melted until spring. Every morning I walked past the trailers, they seemed a little shorter due to the increasing depth of my path. There didn’t have to be any snow falling from the heavens, all it took was a little wind and you have what you call a ground blizzard. Never experienced that before coming from Evergreen Colorado. Everyone in the area kept saying how unusually cold it was that winter. Still not sure I buy it. Between then and now, Summer has willingly carried me through many types of competition – reining, cow horse, trail, dressage, stadium and cross country jumping – to marked success that I credit wholly to her awesomeness. She has carried me and my loved ones down many trails. We had to sell her once because of finances and thank God, I was able to get her back a couple years later. She has lovingly raised four amazing foals for us, much to her evident enjoyment as well as ours. Summer devotedly cares for her foals like no other and passes along her beautiful head, good bone and feet, great disposition and South Dakota orneriness. A couple years ago Summer and I did a little Eventing with decent results, especially when you consider the typical competition against my six-hundred dollar cow pony. She was off last year to enjoy motherhood and I started out this spring full speed ahead to compete in Eventing again. I don’t know if it was my lack of riding last year, competing or what, but I was on a mission. Four competitions into that mission, I have been slapped around in a few different ways, nothing to do with Summer and I have to say I am a better person and horse owner on this side than I was at the beginning. I am just so thankful for Summer and her tolerance of my whims. She is game for anything, takes care of us as part of her herd, she invented power naps and wholly prefers wide open spaces to any stall. She enjoys showing and working toward something as much as I do. Hopefully it keeps things interesting for her. Summer doesn’t like to do much if it doesn’t have a purpose. I know that as a long-time horse junkie, I take for granted the therapy that I get from horses. This time I got something I lacked from Summer’s success. I wanted more. I don’t know really if it was some kind of validation for me or if I wanted to impress people, but that really doesn’t matter. Summer is not my therapist, nor does she need that burden, but she inspires me to want to improve who I am as a person and as one of her people. She makes me want to keep learning, go back and re-learn, be patient, quiet and listen better. For me, it is not about what I can get her to do – the destination, but the journey of learning and doing what is best for her. She makes me want to improve, change, get rid of old ways and habits to learn a better way to communicate with her. Let go of my ego and learn from my failures. To still compete, but do it in a way that puts her first and doesn’t look at what the results are, just that we did our best that day and learned something from it. To always consciously have her best interest in mind and to see her world through her eyes. Thank you for putting up with me Summer. I love Summer. 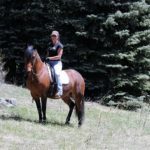 If you keep your own horses at home in our mountain area, you know that we don’t fit into the average book on “horsekeeping on small acreages”. Of course even from property to property the technicalities can vary greatly because of geography, covenants, flora and fauna. This is the first installment in a series of what to consider while you enjoy having your horses at home. Fencing is a very broad topic and varies from neighborhood to neighborhood with what the covenants dictate, what the ground will allow and of course what you can afford. Whatever you do, consider the wildlife that we enjoy and share the mountains with along with your horses. The Division of Wildlife has a “must read”, excellent brochure on many types of fencing and specifications that work for wildlife and livestock – go to www.wildlife.state.co.us and find “Fencing with Wildlife in Mind”. In general, elk and deer need to be able to safely jump the fences and calves and fawns need to be able to safely crawl under. With our arid climate and in order to protect your land from erosion and being picked down to dirt fairly quickly, it is always important to have a sacrifice area, lot or runs to keep your horses off of a larger turn-out area for periods of time. 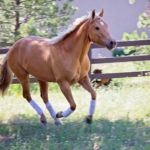 Maybe you only have enough for a small lot, but if you have an area that is larger, it is worth some cross fencing to allow a little grass to grow for your horse to enjoy and feel like a horse. The fencing on your lot or runs should be made of very safe, secure and sturdy materials since the horses will be in there for longer periods of time and will likely be using it for itching, leaning, and reaching. Other things to consider are the level and space between the fence to prevent a leg, head or other body part from being stuck or rubbing their mane out. 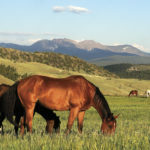 The Colorado State Extension Service at www.ext.colostate.edu has great resources for managing local small acreages and they would welcome your call or email. For fencing materials, there are many options that can be aesthetically pleasing and fairly inexpensive to obtain. Look for local resources that are readily available to save money on the freight and materials. Beetle kill wood is one example of this in Colorado, whereas in Texas it may be pipe and cable. One application is “Zig Zag” or “Worm” Fencing that uses long straight trees, is attractive, requires no post holes, is relatively easy to install and if you or someone you know is mitigating Lodgepole Pine off of their property, it can be quite inexpensive or even free. For the majority of the properties up here, there is just not any way to get around feeding horses some amount of hay year round. Our grass just does not get enough moisture to recover that quickly. There are a few properties that can and the rest of us suffer from pasture envy. The stocking rates are around one 1,000 pound horse per 30 acres of dry pasture, but a water source can improve that number. Using rotational grazing by cross fencing sections or cells of your pasture will increase the grass production and pasture health, but not your stocking rates. The principle used on this land is called “take half, leave half”- Your horses eat down half of the forage and then you remove them from that portion for about 30 days to let it recover. Many people in our area limit the pasture turn-out time of their horses to a number of hours that works for them, their land and grasses. One disadvantage of this is that the horses may only eat one type, their favorite type of grass during that period, making the recovery for that grass difficult. It is important to mention that when your pasture or lot has trees in it, it critical for the horses safety to trim any dead branches off from ground level to a couple feet above their eye level to keep them from poking eyes, legs and other body parts. Hay Storage and fencing can be related if you don’t have a place in your barn or a hay barn to keep it from other hungry hooved animals. If elk and deer get into your hay, it is not only costly to you, it is not good for them. Refer again to the above DOW brochure on “Fencing with Wildlife in Mind” for great hay storage solutions. Some options include fencing in a storage area that must be 7-8 feet high to keep elk and deer from jumping in. Panels, similar to large wooden pallets, are also functional and can be moved around to different locations. While in use, the slats on the panels should be vertical to prevent them from being climbed and also secured together to create a complete barrier. Of course, hay should be kept securely tarped (remember the wind!) and off of the ground. Copyright 2013 Heather McWilliams, MtnHomes4Horses.com.